Halloween time is zombie time! Seeing as how Halloween is in just a few days, I figured it was time for some theme-appropriate sketches. I’m a total zombie fan, even though I am a super huge wimp and hate hate hate blood and gore. I think it’s an interesting idea, and it was totally my go-to Halloween costume all through undergrad. I even drew 23 pages of a zombie comic for a final project in undergrad. Given all that, how could I resist the chance to draw some Halloween zombies? 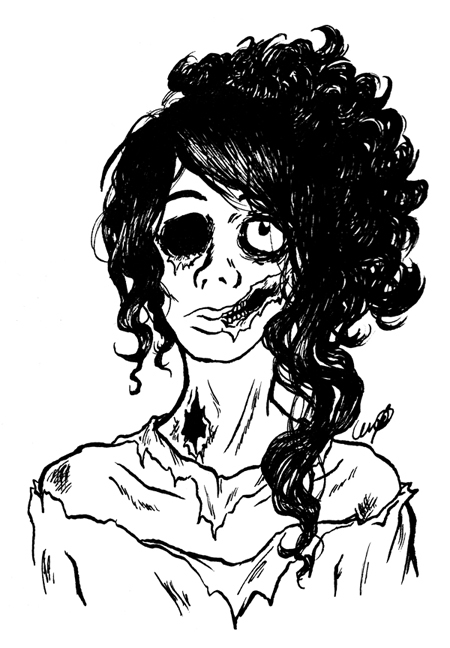 This is the as-of-yet-unnamed protagonist of the aforementioned zombie comic. I haven’t drawn her in ages, so this was fun to do! I love coming back to old characters and redrawing them; it’s a friendly, familiar feeling. 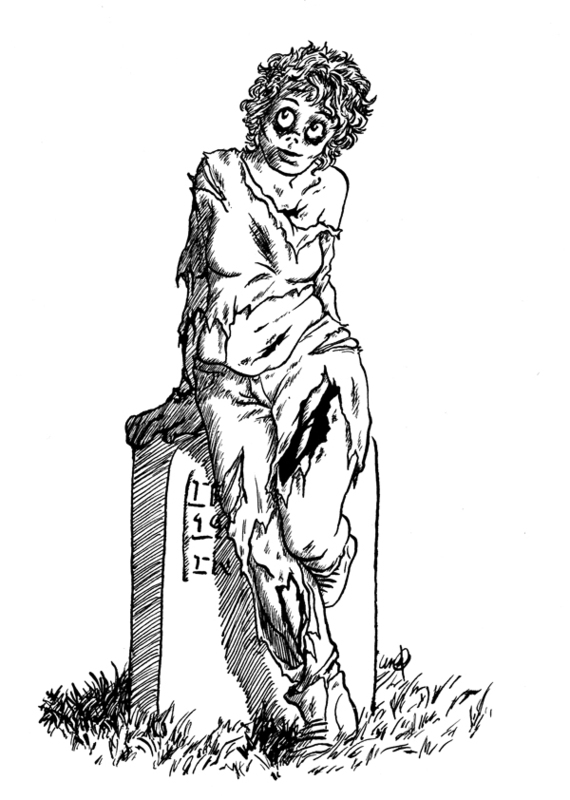 She’s in a little worse shape here than she is in most other drawings of her–I figure this is her later in life when she’s worn out a little. I don’t know who this is, really, but I like how she came out. You don’t see a lot of chubby zombies in the grand scheme of things, which seems a shame. I had a lot of fun drawing her, especially her belly and ripped pants. I’m trying something new with both these drawings. I sketched them in my normal way–with a drafting pencil during a lecture–but inked them with a G-nib. I haven’t inked with a nib since last year, when we were required to do it for a class assignment, and I hated it! I didn’t feel in control of my pen, I got ink all over myself, and I even made myself bleed a few times (not that that’s a normal experience with a nib; I just have a fantastic talent for accidentally injuring myself with my art tools). Some of my classmates swear by the G-nib, and Aaron also recommended I try it, so I picked one up earlier this week when I couldn’t find refills for my Pocket Brush. And here’s the thing: I kind of love it. I don’t want to, since pens and the Pocket Brush are way more convenient and travel-friendly, but I really like how much detail and line variation the G-nib allows. I’ll keep working with it, probably in conjunction with my other tools, but for a first experiment I feel like this went pretty well. I’m going to a Halloween event at Comic Boom! in Keene on Saturday and am thinking about doing some Halloween-themed pin-ups for that, so those’ll probably be my next experiment. I’ll post ’em on Friday if they work out! In the meantime, though, I’d love to hear if/what you guys are dressing up as for Halloween. In keeping with the zombie theme of this post, I’m thinking of going as a zombie hipster, but man am I open to other suggestions! ← Me? Awake on a Monday? What a novel idea!